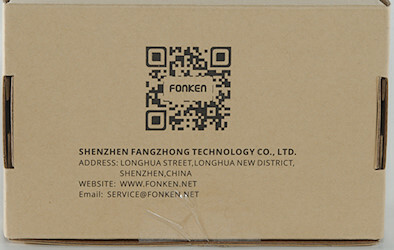 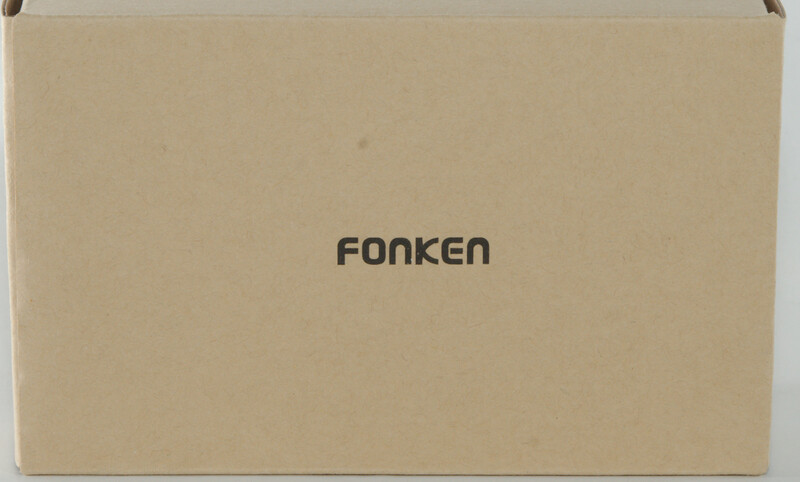 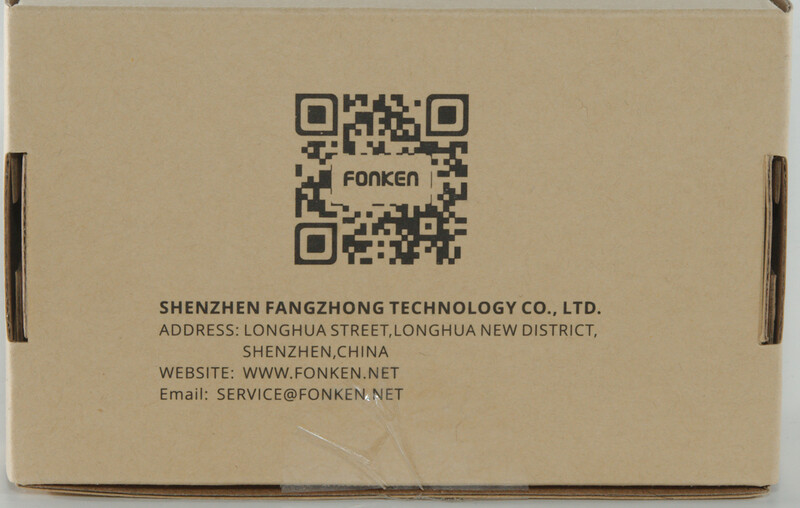 It was in a brown cardboard box with the Fonken name on it. 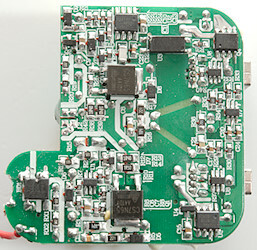 There is a blue led inside the charger that can be seen through empty usb connectors. Minimum QC3 voltage is 3.8 volt. 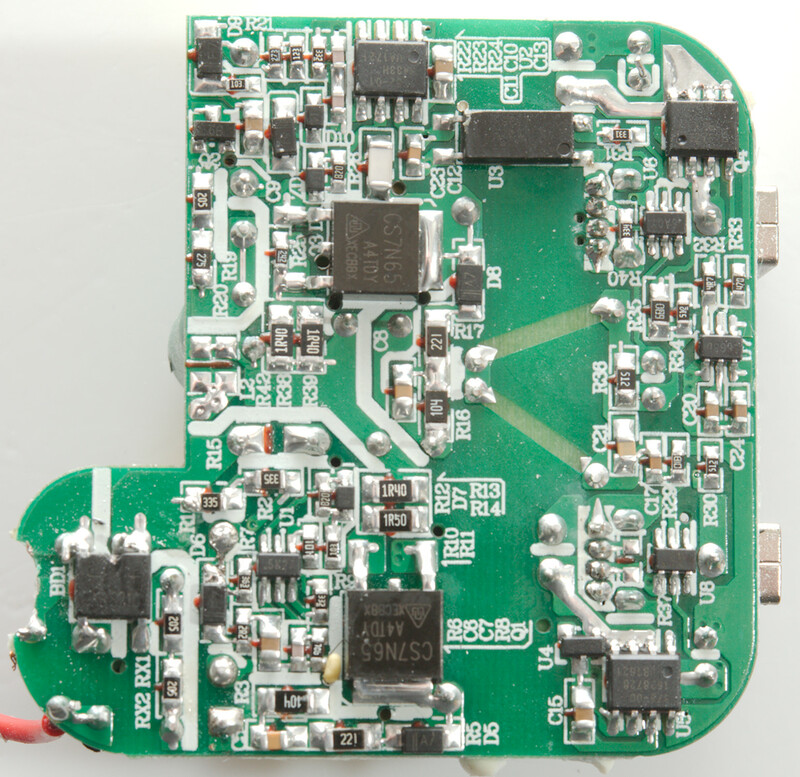 There is a led behind each usb output. 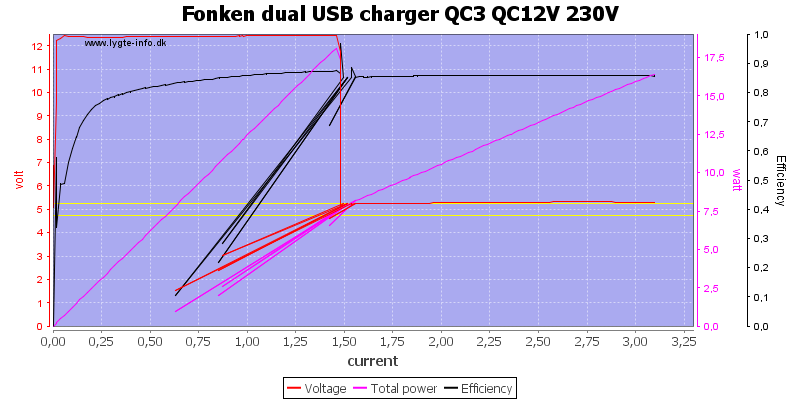 The 2.4A output can deliver 2.5A, this is fine. 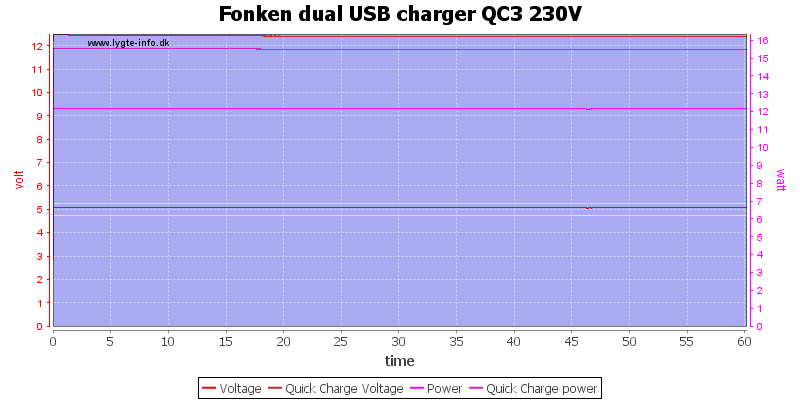 And about the same at 120VAC. 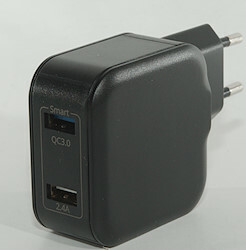 QC output is rated for 3A and can deliver slightly above 3A. 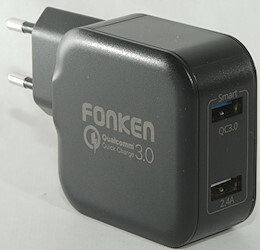 Output increases with load, this means it has cable compensation. 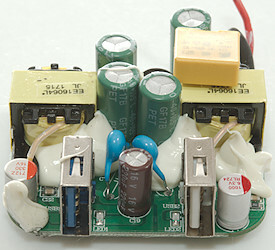 AT 9V it is rated for 1.67A and can deliver 2A. 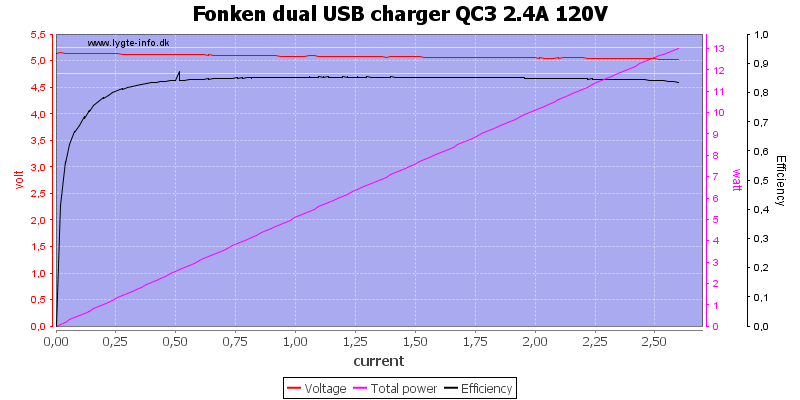 Running both outputs up to a bit above rated current worked fine. 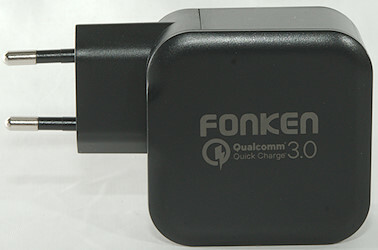 The charger could run for one hour at rated load. 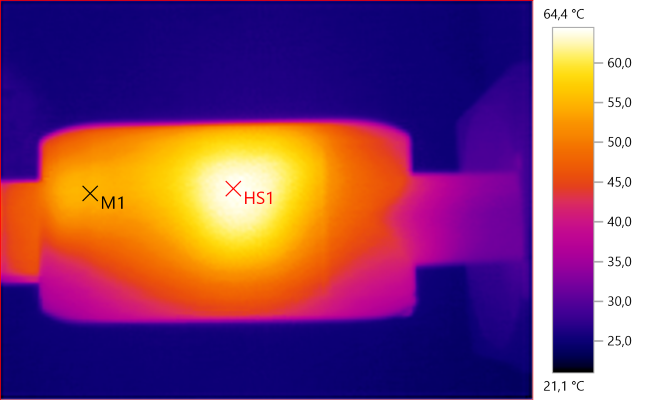 HS1 is one of the transformers. 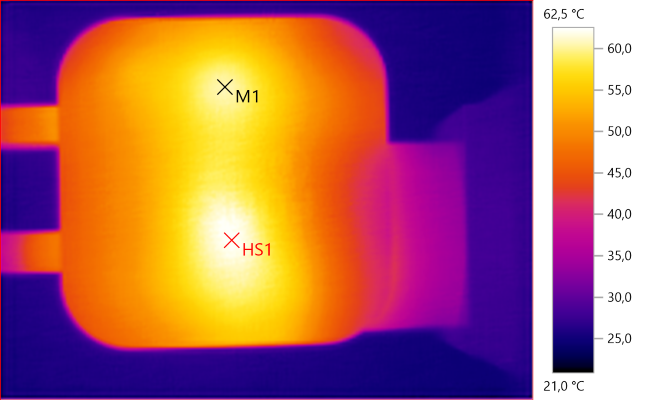 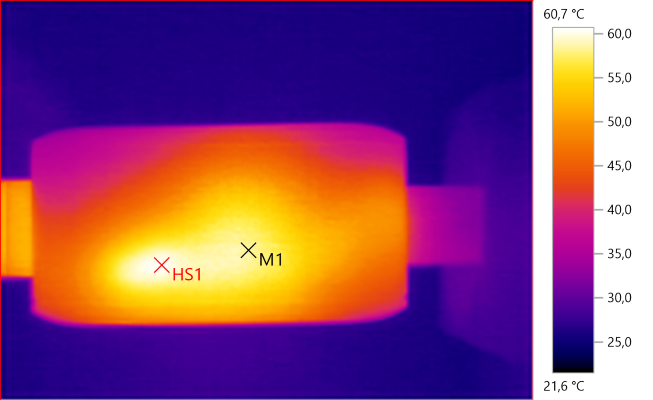 M1 is the capacitor on top of a transformer, HS1 is the other capacitors transferring heat from the transformers to the enclosure. 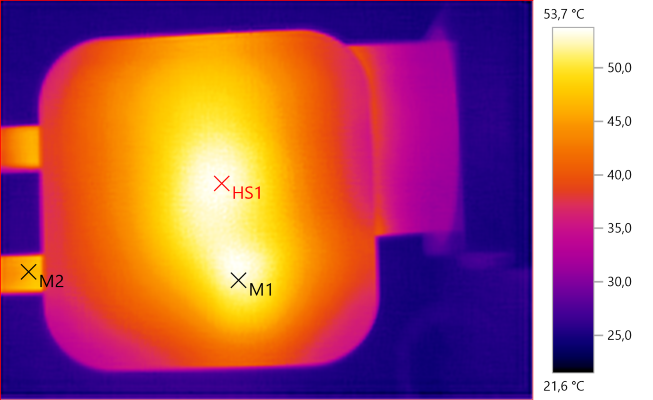 HS1 is the switcher transistor for QC and M1 is for 5V. 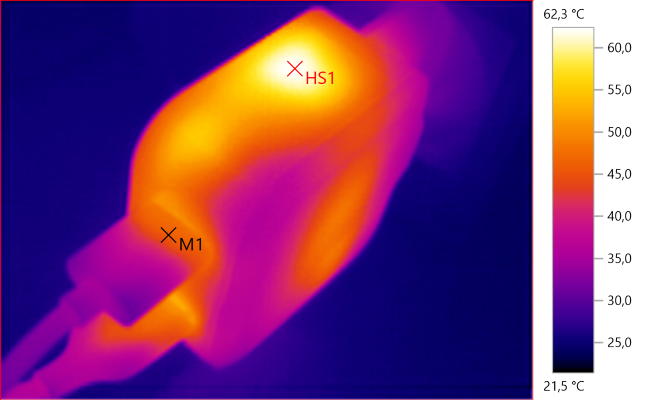 At 2.5A the noise is 31mV rms and 700mVpp. 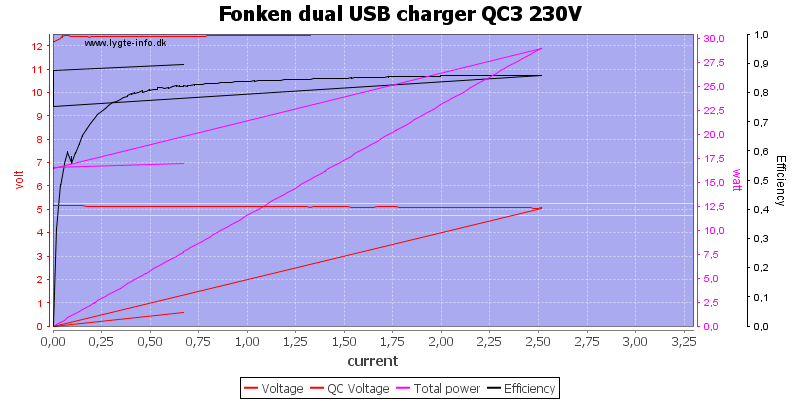 At 0.5A on the QC output the noise is 23V rms and 357mVpp. 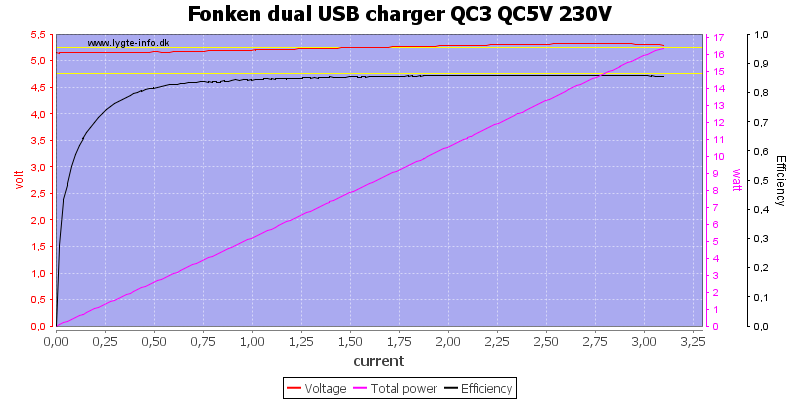 At 2.5A on the QC output the noise is 35mV rms and 437mVpp. 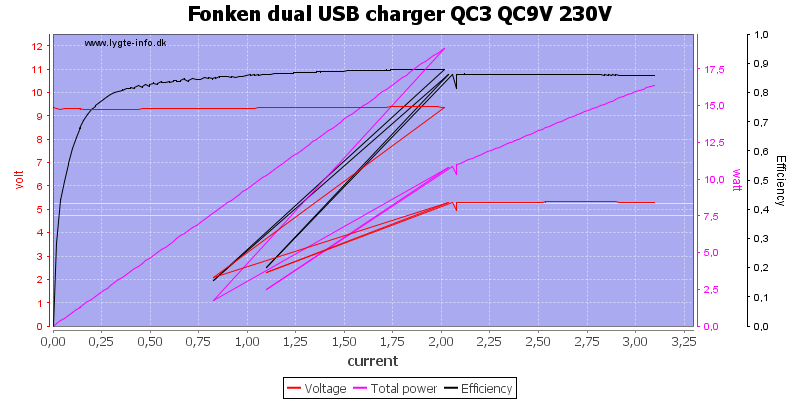 At 9V and 0.9A on the QC output the noise is 30mV rms and 375mVpp. 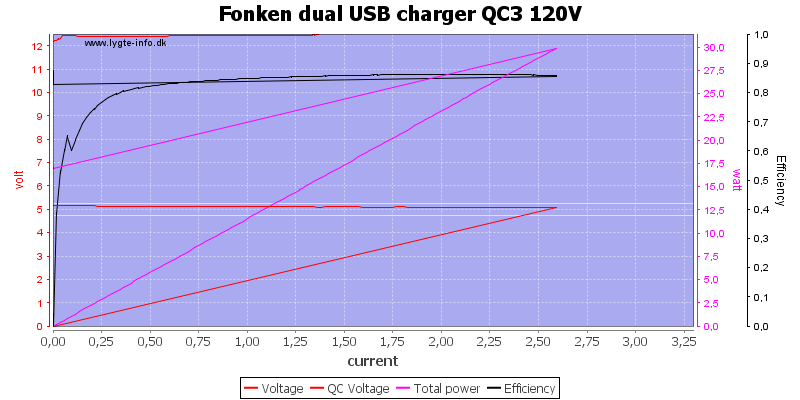 At 12V and 1.2A on the QC output the noise is 30mV rms and 428mVpp. Pressing the sides a bit with my vice and I could break the lid off with a screwdriver, but I could not get the circuit board out before I had cut the other side off. 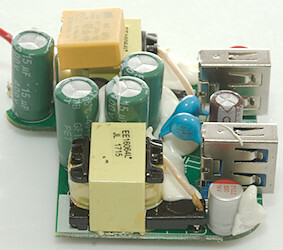 A fairly compact construction, with two transformers, but it have the low volt side very far away from the transformers. 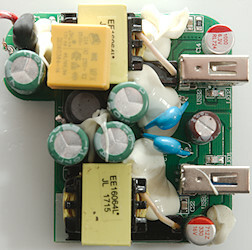 The input circuit is common. 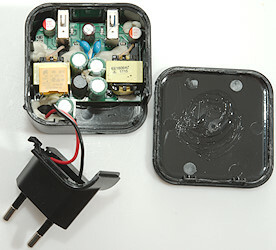 At the mains input is a fuse in black shrink wrap. 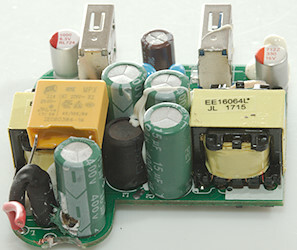 Between the smoothing capacitors is a inductor (L1). 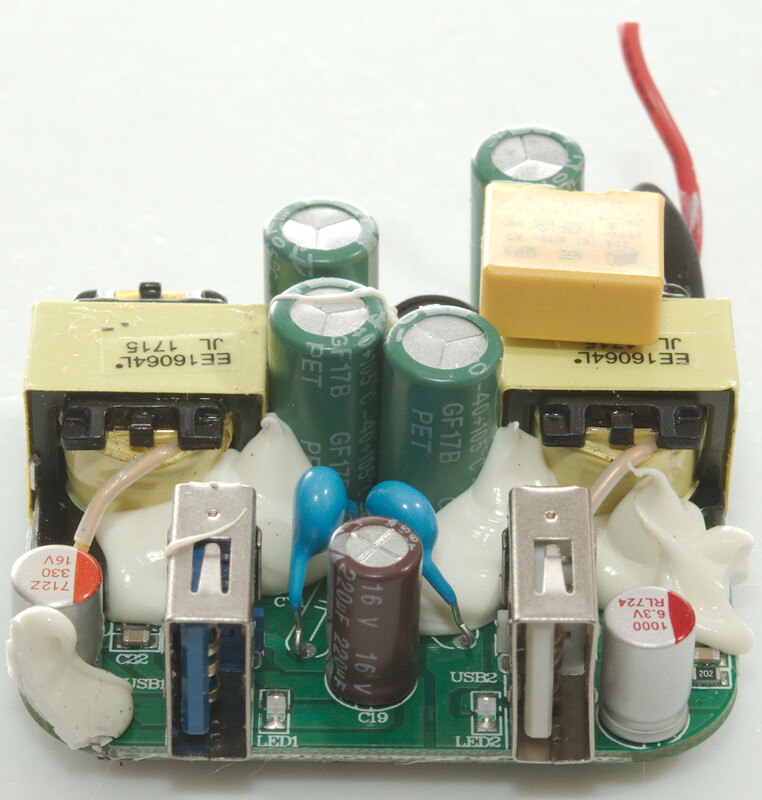 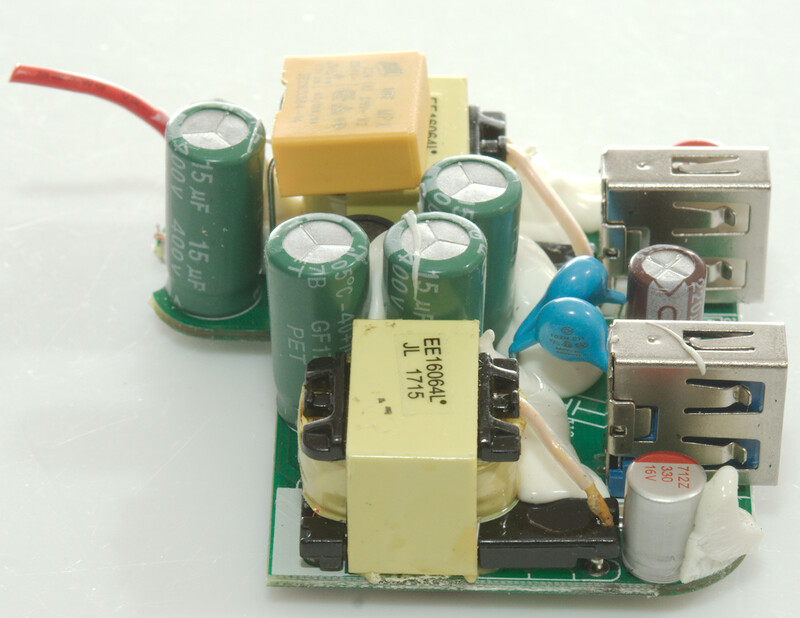 There is a blue safety capacitor for each circuit. 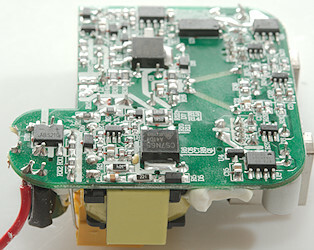 Each usb output has its own led (LED1 & LED2). 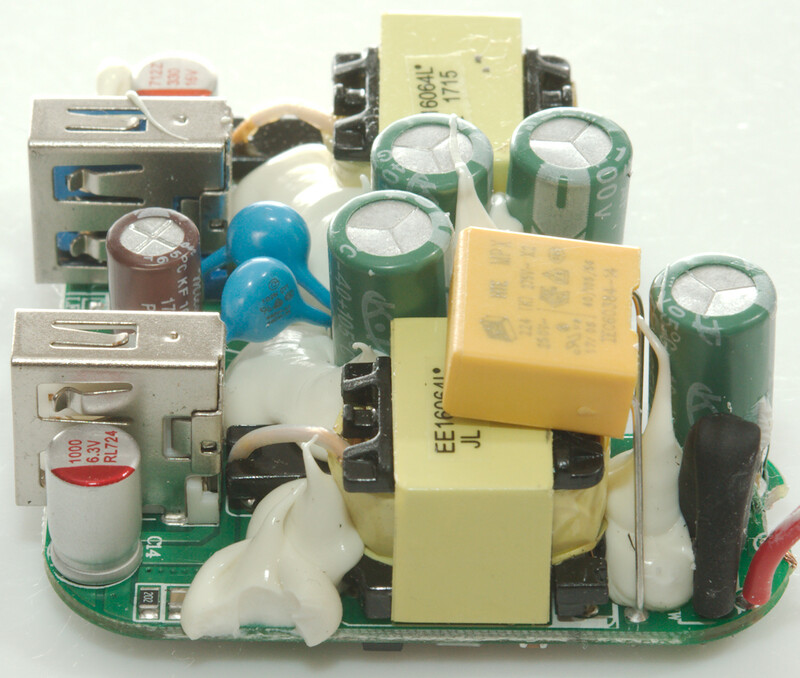 I was a bit hard on the circuit board and a capacitor while trying to get the circuit board out. Most of the parts are on this side. At the mains input is the bridge rectifier (BD1), there are two switchers, one for the fixed 5V (U1: Marked 5K27) with a switcher transistor nearby (Q1: CS7N65, MOSFET 650V 7A). The other switcher is for the QC output, it used a 8 pin switcher controller (U2: Marked 1782-01/RA33H/UA1721), it uses a similar switcher transistor and due to the QC it need feedback from a opto-coupler (U3). The 5V output has synchronous rectification (U4: Marked 4X0A, U5: marked 873-00/1628728/UB1621) and a auto coding chip (U8: UC2633). 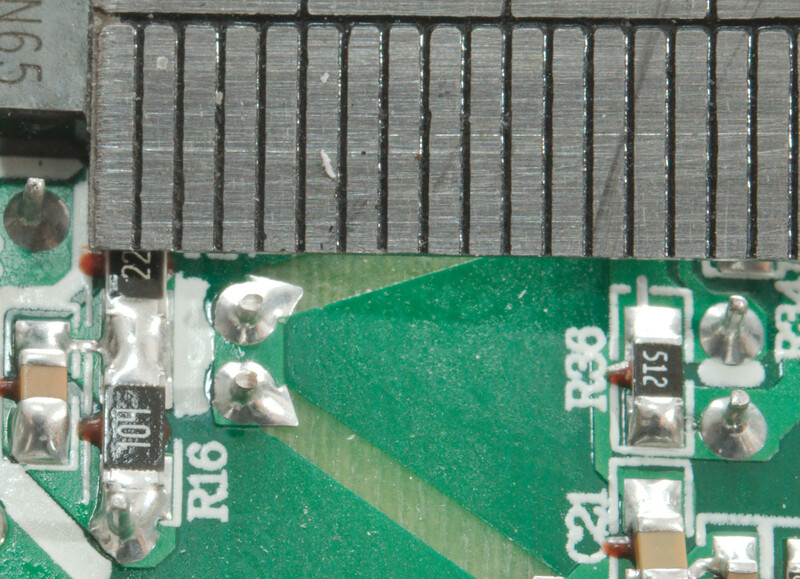 The QC output has a transistor for synchronous rectification (Q4: VS1018A 60V 18A 9mOhm) with a controller chip (U7: marked 6G3D) and a QC controller (U6: Marked 6AY0). 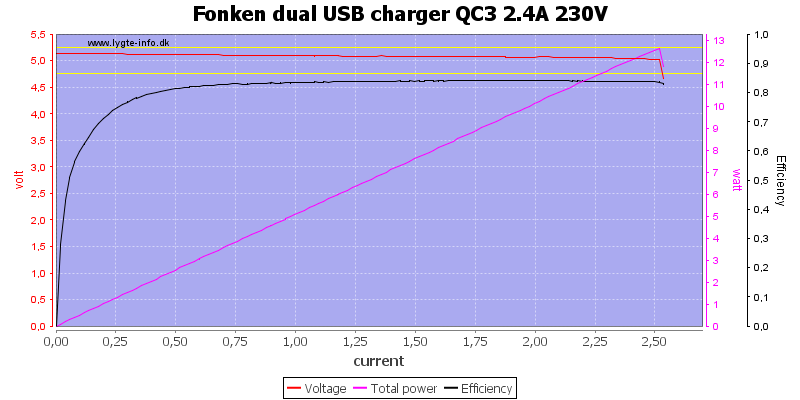 The charger passed the 2830 volt and the 4242 volt test. 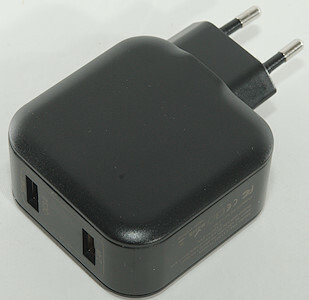 With two port that can each deliver full power, auto coding on one port and QC on the other and no safety problems this looks like a good charger, even with the slightly high noise level.